January’s National Bath Safety Month is all about preventing unnecessary risks in the bathroom. By taking the right precautions and adhering to our top six bathroom safety tips, you can create a safer bathroom environment for you and your family and reduce the risk of any unwanted slip ups! Non-slip mats are a low-cost and simple way of preventing slips and falls in the bath and shower. If you have a tiled floor in your bathroom, you may also want to add a non-slip mat outside the bath to make that step out a little easier. If you’re worried that a non-slip mat won’t suit your design scheme, a wooden slatted duckboard would make a great addition to the modern bathroom. Grab rails located above and around the bath can also ensure a safer bathroom experience. Ideal for multi-generational living, contemporary grab rails will offer that extra assistance required for getting in and out of the bath without tarnishing your bathroom design. Testing the temperature before stepping into your bath is a must. Whether you’re running a bath for your children or creating a hot tub haven for yourself, ensuring the water temperature is not too hot before entering will reduce the risk of scalding. 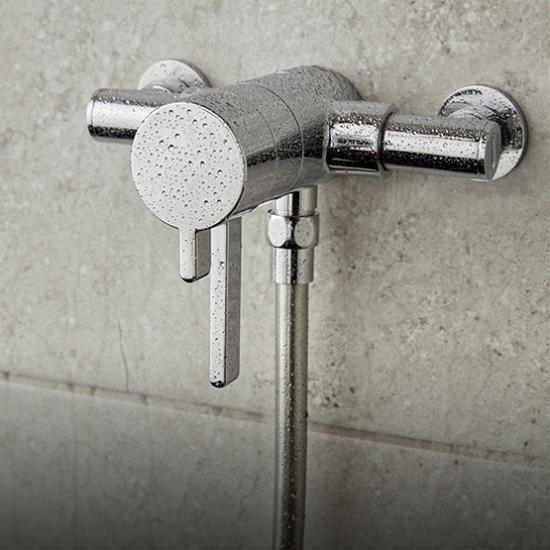 By installing a thermostatic valve, you will also prevent sudden pressure fluctuations and cold-water isolation. Installing an adjustable shower head and handset will allow you to tailor your shower to your perfect height and depth. By manoeuvring your shower to suit you, you can minimise those outstretched body movements and reduce further risk of slipping. Correctly storing and hiding harmful items such as a razors, tweezers and cleaning agents is vital if you have children in the home. Stowing potentially dangerous items into cabinets and vanity units after use will ensure nothing is left to your children’s imagination. Keeping your bathroom free of spills will reduce the risk of falls, especially if your bathroom has tiled flooring. If you see a spillage on the floor, make sure you clean it up; you wouldn’t want the next person falling over your mess! Making small additions and implementing minor changes can drastically reduce risk in the bathroom. By adhering to these simple tips, you can enjoy a risk-free bathroom experience.